William Frederick Cotton was born in London on 23rd April 1928 with show business in his blood. His father was the famous Band Leader Billy Cotton who kicked off his massively successful BBC show in the 1950? with the cry of ?Wakey, Wakey!? Young Bill was educated at Ardingly College with his brother Ted ? ?it made Bleak House look like a holiday camp.? He turned down the chance to go to Cambridge. Instead he went to work for Noel Gay as a song plugger. Having learned the music trade he borrowed �1,000 from his father and set up Michael Riene Music with partner Johnny Johnston. In 1956 he joined the BBC as a producer.He worked initially on the Six-Five Special with Tommy Steele. Many other performers have been grateful for his faith in their talent; Russ Conway, Dave Allen, Des O?Connor and Cilla Black to name but a few. In 1962 he was promoted to Assistant Head of Light Entertainment. One of his first signings was the Two Ronnie?s. Their contract was for 13 weeks. It continued for nearly 20 years! Sir Bill also spotted a reporter named Michael Parkinson and signed him as the chat show host of Parkinson which became an instant hit and ran until well after Sir Bill?s retirement.In 1968 after Morecambe & Wise had a disagreement with their boss Sir Lew Grade, Sir Bill signed them up. Much later he said he had paid far more for their act than they were worth but their success more than repaid his initial investment. In the Netherlands he paid the princely sum of �25 for the rights of a game-show called One Out Of Eight. Sir Bill persuaded an initially reluctant Bruce Forsyth to front the re-named show ? The Generation Game. Bruce said the show ?changed my life, Bill was responsible for what I think was the golden age of the business. He knew about Television and he knew what the public wanted and he gave them what they wanted. He also knew how to treat performers ? and even how to get them to do things even if they didn?t want to. He talked them into it because he knew it would be good for them and the show.? Bill championed a show which many said it might cause offence ? Dad?s Army. David Croft and Jimmy Perry who created the show said it was only Bill?s belief in the show and his ?nose for a hit? that won through..
During his period as Head of Satellite Broadcasting the BBC entered the ?soap ear? and Sir Bill oversaw the production of ?East Enders? and daytime TV. In 1982 he was finally appointed Managing Director of BBC TV. However, he found his time in management frustrating. He did not like the bureaucracy and endless meetings. He was a programme maker and that was his great ability. 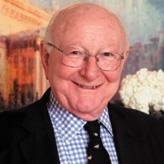 Sir Bill left the BBC in 1988 but continued to work in various roles including Chairman of the ITV company Meridian and, in 1992, President of the Royal Television Society. In 1998 Sir Bill was awarded The Academy Fellowship the highest accolade given by the British Film and Television Academy. Mark Thompson, the currant Director General of the BBC, said that ?Bill Cotton was one of the giants of BBC Television who for nearly three decades brought countless programmes to the screen which themselves became legends. He was both a great impresario and also a passionate believer in public service broadcasting.? Sir Bill was a Vice President of the Marie Curie Cancer Care charity, a charity for which his wife Kate works tirelessly. He was made a Knight Bachelor in 2001. Sir Bill was married three time and had three daughters and a step-daughter.